Artist Jeff Zimmermann might be more nationally-recognized these days for his controversial large-scale urban mural of everyday Memphis residents. 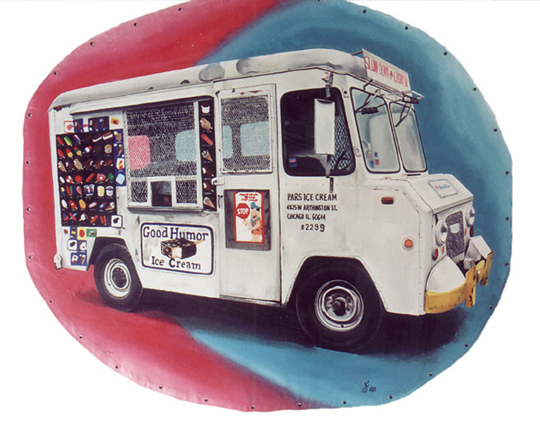 But back in the early 2000's, this Chicago-based artist developed a series of colorful ice cream trucks, that, with summer finally here, fittingly deserves a resurrection. 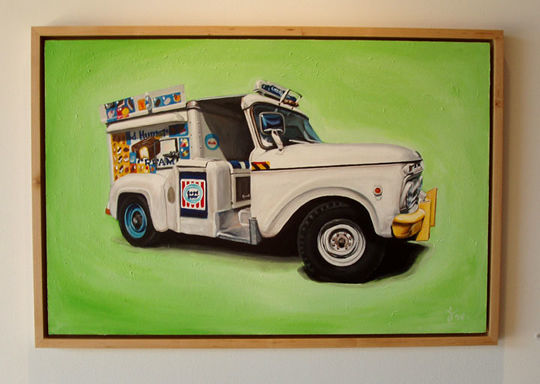 The series, titled "Vehicle," is of vintage ice cream trucks painted in vibrant, bold colors, by themselves, with no grumpy old ice cream man or throngs of children in sight. But even if the quintessential image isn’t fully there, its doesn’t keep you from revisiting your own childhood nostalgia or help bed off any ice cream cravings while viewing the collection. 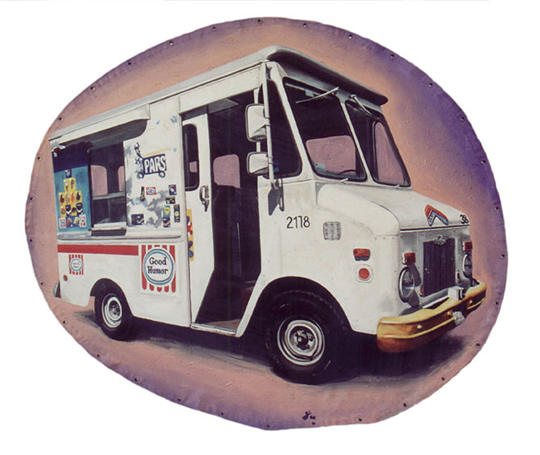 Zimmermann captures the underlying beauty of the childish, sometimes tacky, generally overlooked ice cream truck. 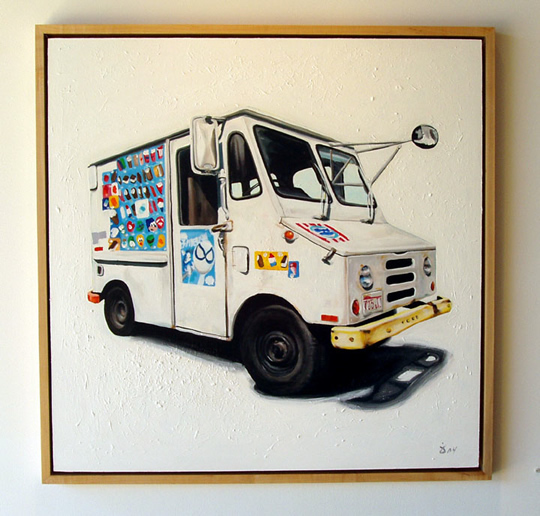 Artist Jeff Zimmermann has bittersweet memories of ice cream trucks. 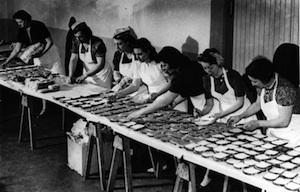 He recalls hearing the faraway jingle of the bells as a little kid growing up in Westchester, running inside the house to ask his parents for change, and then coming back outside to stand in line. He remembers the summer sun, the trees and the lawns, the enticing colors of the treats painted on the sides of the truck. Zimmermann-who usually bought frozen bubble gum- also recalls how prankish teenagers would distract the vendors long enough so one of them could climb behind the wheel and drive the truck down the block. He and the other kids would sit on the curb laughing. "The driver would get all pissed off," Zimmermann says. "After a while, if there were any older, bigger kids on the block, the guy wouldn't stop-he'd try to blow right past us. But the trucks couldn't go very fast, and we could run fast enough to keep up with it...Eventually, they wouldn't come to our block." 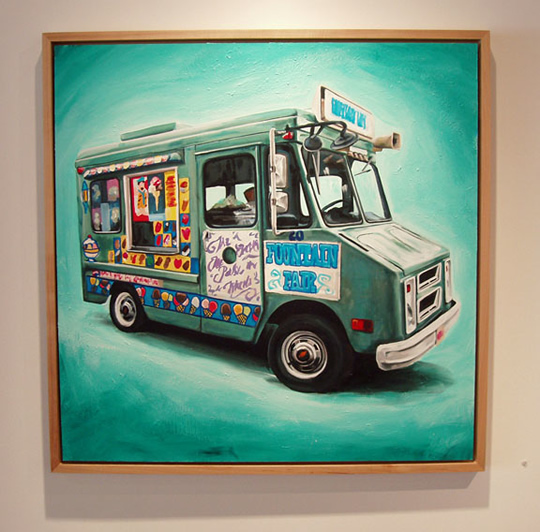 Zimmermann didn't start thinking about ice cream until a year ago, when he painted a large, realistic acrylic on canvas of a blue Fountain Fair truck ­"The Ice Cream Parlor on Wheels"­ based on a photograph he had taken. He sold the piece out of his studio, and then did another one very similar to it. "It came to me that I love these things, and I didn't want to paint just one," he says. "If you hang just one, it's cute­it doesn't evoke any ideas. 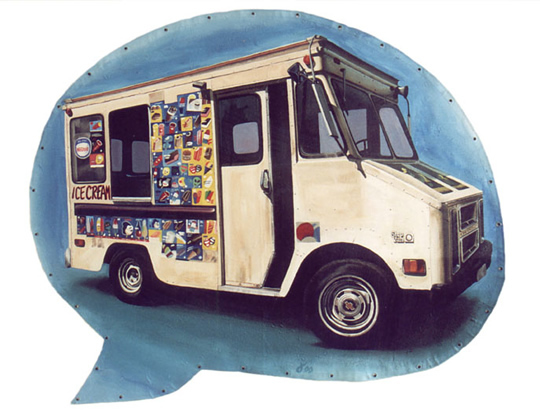 Everyone can identify with ice cream trucks, bring some memory and emotion to them. You hear the jingle of a bell and have a feeling, like remembering the summer, or Mr. Johnson's or Mr. Ahmed's smiling face. People love them for that, and can relate. to that." The series is unfortunately not currently on display. However, original studio works are available for sale by contacting the artist through his website.